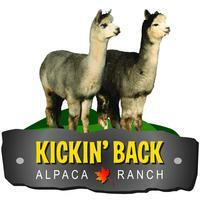 Finally, Prince Valiant 1 has arrived at Kickin' Back Alpaca Ranch! Unfortunately it was too late for the 2012 breeding season but he bred 3 females in 2013, and 3 females in 2015 and we are very pleased with the results. Valiant is a dense typey medium silver grey male with excellent character. He is easy to handle and prefers to put his halter on himself. 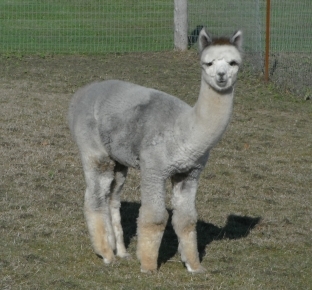 His fleece is dense with a beautiful uniform crimp, characteristics exceedingly rare in gray alpacas. Check out his histogram for 9 years old, 22 AFD and fibers >30 7.5. Prince Valiant has full body coverage. He has excellent conformation with a strong frame. He is a proud flashy male, an excellent breeder. When bred to grey or black he produces grey. Of his 16 crias registered, 9 are female, 10 are grey. 2015 was a great year - he produced two stunning tuxedo greys, Mars and Reese's. He is passing along his gorgeous fleece and incredible phenotype to his offspring If you want to add some awesome grey to your herd, Valiant's stud fee for 2017 is $1,000. Ask about discounts for multiple breedings.